LiveViewGPS, adds a new Mobile Personal Emergency Response System (mPERS) product to its innovative portfolio with MyShield PERS. MyShield PERS, is a wearable personal emergency response system that allows wearers instant access to live emergency assistance. It uses the powerful combination of wireless connectivity, GPS location, and live operators on the other end. The device is rough and tumble making it suitable for use in a wide variety of situations. It is also waterproof so that it can be used indoors and out. The MyShield PERS mobile personal emergency response solution utilizes SmartCall functioning so that persistent dialing occurs until a connection is made. Calls cannot be disconnected by either the wearer or an attacker. The embedded GPS location technology means that in an emergency, locating the wearer is fast and simple. 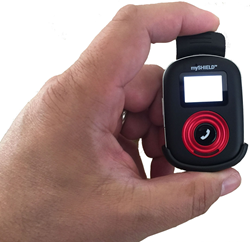 The MyShield PERS device sends GPS information every two hours or when the panic button is pressed. It also offers location on demand services so that all devices can be monitored via the web and wearers can be located quickly if they fail to check in or are unable to respond. Located in Southern California, LiveViewGPS is a location-based services (LBS) company that provides gps tracking and wireless location products and services for Fortune 100 companies; small businesses; federal, state and local government agencies; law enforcement and family safety. Its GPS tracking devices include vehicle and fleet-tracking systems, asset trackers, trailer tracking systems, surveillance monitoring tools, people tracking devices and GPS asset protection equipment. Products are backed by knowledgeable sales and technical representatives to ensure users purchase the right systems that will work flawlessly. For more information, for a free demo or to place an order, visit http://www.LiveViewGPS.com. Press Inquiries: George Karonis, 1-888-544-0494, or 1-661-294-6805.